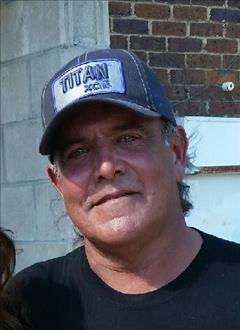 Daniel "Dan" Powell, 56, of Lohrville passed away Saturday, April 6, 2019 at Stewart Memorial Hospital, Lake City. Funeral services will be 11:00 a.m. Thursday, April 11, 2019 at Laufersweiler-Sievers Funeral Home. A visitation will be 4:00 to 7:00 p.m. Wednesday at Laufersweiler Funeral Home. Daniel Lerenzle Powell was born June 8, 1962 in Fort Dodge. He attended catholic schools in Fort Dodge and Saint Edmond High School. On July 25, 1980, Dan married Darlett Paterson and the couple made their home in Denison, where they raised their children, Dennis, Diana, Danielle and Derek. Dan was employed with Dubuque Packing Company until 1991. In 1991, he moved back to Fort Dodge where he began working at Western Auto and then Doors Inc as a welder. Dan and Darlett later divorced. On June 5, 1997, Dan married Angelia Martens in Fort Dodge and the couple raised their children, Daniel and D.J. at their home in Moorland. Years later they divorced. In 2004 he moved to Lohrville and has been working at Scranton Mfg. for the past 14 years. He and his girlfriend Drenda have been together for 7 years. They bought a home together 2 years ago in Lohrville, IA. Dan had many hobbies to speak of. He enjoyed racing and working on cars. He earned many trophies over the years. He liked to go camping, fishing, hunting, roller skating, bowling and spent hours every night working on his family farm. Dan is survived by his children, Dennis Paterson of Anthon; Diana Heath of York, NE; Danielle Powell of Anthon; Derek Powell of Correctionville; Daniel Powell and D.J Powell both of Otho; 19 grandchildren; mother, Gloria Strange Underwood of Fort Dodge; significant other, Drenda Langfitt and children Kurtis, Kristen, and Karlan of Lohrville; siblings, Mark Powell; Vern (Sue) Powell; Cindy (Mitch) Summers; Tina (Mike) Wuebker; and many aunts uncles, cousins, nieces, and nephews. "I am so sorry to hear of your loss. May you be comforted by your memories love and the touch of his life through you. Sending you all my thoughts and prayers for the days ahead- Peggy Hoyt, Scranton, Ia"
"Thoughts and prayers to the family, Tracy Johnson"
"loving thoughts to his entire family. Kevin and Toni Hammer"
"So sorry to hear of Danny's passing. He was such a jokester as I remember him as a young kid, always laughing and playing jokes on the family. He will be greatly missed by all who knew him. l love you guys and miss all of you so much. Sincerely, Ruth Robb from Missouri"
"He used to always call me 4 eyes growing up. I hated it but also always think of him now whenever I hear someone say it. RIP Uncle Dan. Now you?re with Aunt Linda and Grandpa Powell??"